If you’ve got an open fire or a wood burner, then having somewhere to keep your logs is a must. The problem is, in more modern style homes the older more traditional log baskets and log holders seem a bit out of place. Thankfully Contemporary Heaven have several modern style log holders that will look great at your fireside. In this blog post we’ll look at two of the lower priced versions that come in a deep black finish and offer tremendous value for money. 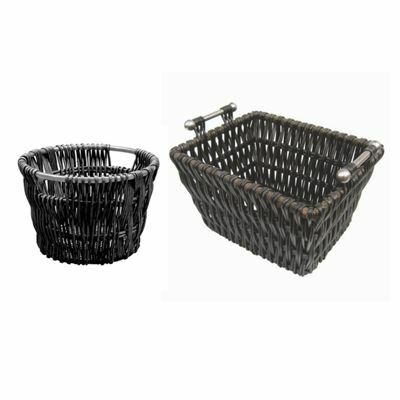 This item comes in stylish black willow with strong and chunky steel handles, so it’s easy to move and carry when you need to fill it up. At 56cm in width, 35cm in length, and 45cm in depth, it’s perfect for logs and/or kindling and at only £39.95 it’s a bargain. Next day delivery is available too. We think you’re going to love these, both for their style and their value. Two products in one this time, you get the larger log holder tub and the smaller kindling tub as a set. Both sit together at your fireside, with laser cut lettering donating the function of each. We also offer this timeless black fire basket, all ready for you to put in your open fireplace and start adding some warmth and ambience to your room. Don’t forget to take a look at some of the other fireside accessories we have on offer on the Contemporary Heaven website.